Township government is the oldest form of government which continues to function today. It began in North America as early as 1636. It was established by early pioneers who wanted to escape the autocratic form of government of Europe. People have a direct say in this local grassroots form of government. The Declaration of Independence statement that "government should derive its just powers from the consent of the governed " continues to this day through the "Annual Town Meeting" held in April of each year. Township government in Illinois began in 1849 when the Illinois Constitution of 1848 allowed voters to establish township government or a county commission form of government. Today, 85 of the 102 counties in Illinois operate under this form of local control. There are currently 1433 townships which serve over 8 million citizens. Township government is designed to serve the basic needs of the community and to provide social services and road maintenance. 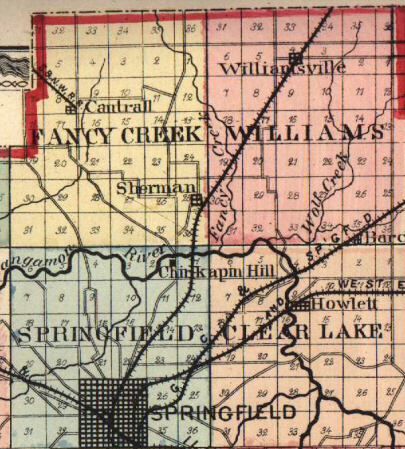 Springfield Township was organized in 1861 and its history is closely identified with that of the city of Springfield. It was originally comprised of government township 16 North, range 5 West, excepting that portion embraced within the limits of Capital Township. Among its early and prominent settlers were Andrew Elliott, Thomas L. and WiIliam P. McKinsey, Samuel H. Reid, James W. Keyes, Goodrich Lightfoot, Simon P. Rickard and Henry Converse. It is bounded on the north by Fancy Creek, south by Woodside, east by Clear Lake and west by Gardner townships. The 2010 census population was 6,245.